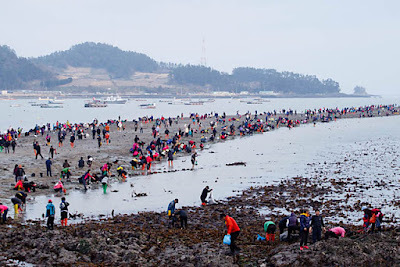 Once a year in Jindo, one of many islands off Mokpo in the province of Jeollanam-do in South Korea, a festival would take place that would seem of biblical proportions. 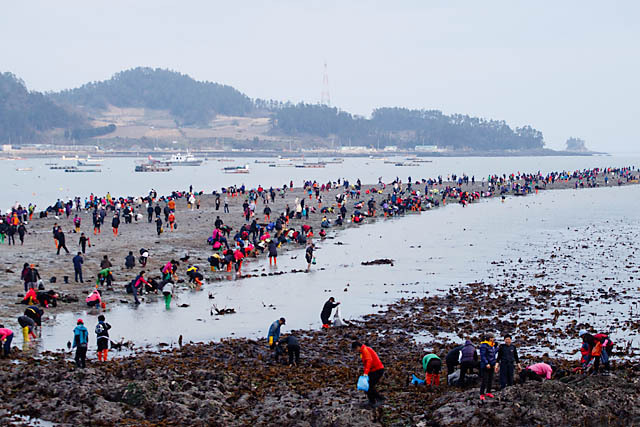 Known as Jindo Miracle Sea Festival, or Jindo Sea Parting Festival, the seas would part to reveal a road leading from Jindo to a neightbouring island. 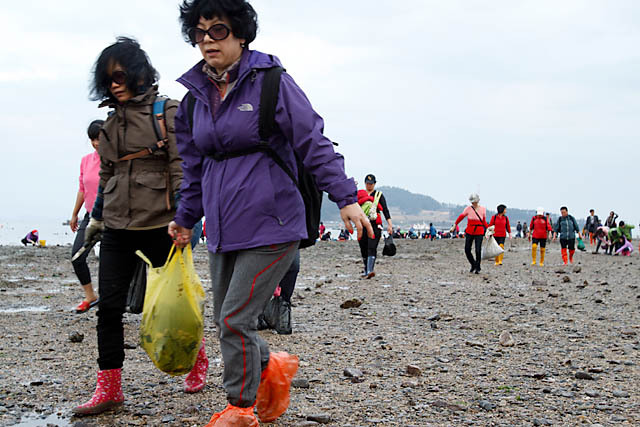 While also known as the 'Moses Miracle', local legend instead tell of an old lady who was somehow left behind when the other villagers in Jindo fled to the neighbouring island because of some wild tigers. She prayed to the Sea God who then parted the sea for her to join her family. 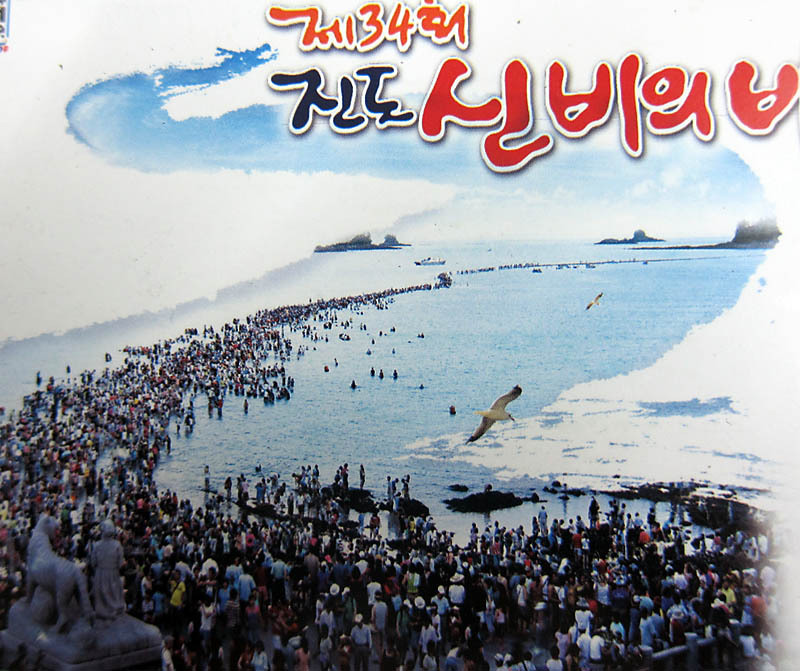 The phenomenon though, divine or not, actually happens 2-3 times a year, when the tide is at its extreme lowest, revealing a land bridge of sorts that actually connects Jindo to that particular island. The Festival though, was to be held only once a year (well to make it special I guess), and during then, you could join in the festivities and walk the 2.8km land bridge to the island. Like many festivals in Korea, a carnival of sorts are almost mandatory, complete with food tents, music and performances. 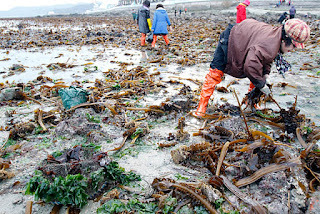 Once evening descends (approx 5pm), when the sea "parts" for an hour or so, the locals spring into action - no, not to cross the parted sea, but to scour the land!! This is something definitely more down-to-earth - free seafood for the masses! From seaweed to mussels, from crabs to abalone, families comb the land bridge for the riches of the seabed. No doubt what sort of dinner these families are having for the week... What a sight! There are express buses from Seoul to Jindo which takes about 5hrs, and there are direct ferries from Jeju to Jindo too. However, for those who would want to enjoy the festival or event longer, it may be a good idea to stay in Mokpo, which is easily accessible via train from Seoul as well. 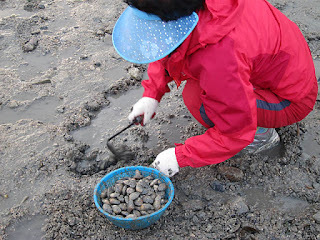 Mokpo to Jindo is just 30minutes by bus. There are a couple of accomodation options in Jindo too, but as the Formula One race had arrived in Mokpo some years back, the upgraded motels in Mokpo seemed very well valued with excellent in-room facilities at affordable prices (we had a luxurious twin room for 55,000 won).